As an American covering Japan, I depend on blogs and other websites that offer glimpses into daily Japan. I believe many people would be surprised to see how many blogs I have in Google reader in my quest to catch things off the radar that other Japan focused blogs miss. … reporting in a cross media fashion about the latest events, goods and trends of anime, game and manga culture in Tokyo’s “electric town” Akihabara. 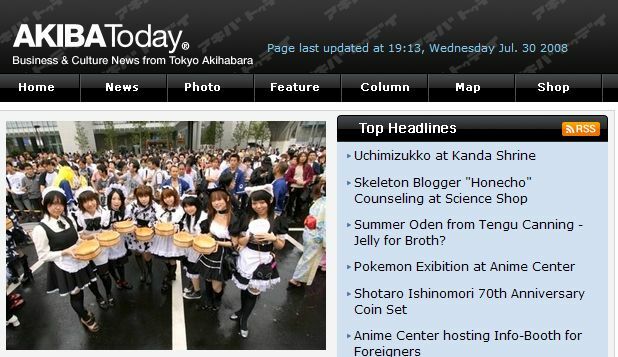 We deliver business news aimed at otaku or fans of japanese pop culture as well as corporations. While their site has that sterile newspaper feel to it, their press release leaves me to believe that the site will be worth following. AKIBA Today‘s first goal is to have 5 million page views by the end of this year. That’s a pretty big goal with less than 6 months left. We shall see.